Email signatures for Outlook, Outlook Web App (OWA) and Office 365. Email signatures, disclaimers, auto-replies, ... for Microsoft Exchange and Office 365. Server-sided email signatures and disclaimers for Office 365. 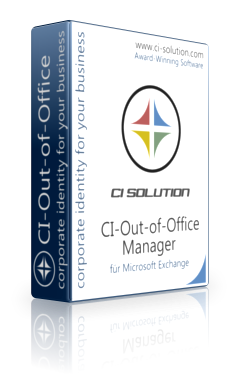 Central out of office management for Microsoft Exchange and Office 365. Simple & free out of office tool for Microsoft Exchange and Office 365. Powerfull email archiving solution for Microsoft Exchange and Office 365. I use the CI-Sign for over a year for about 600 users and it works very well. The support and performance are just great! Praise to you Mr. Büttner. I can only report on the support (telephone & email). Problems are always handled competently and friendly - usually within the shortest possible time. Super product, SuperSupport, fast response and response time. Keep it up. Very fast and good support! We've tested several solutions (Exclaimer Signature Manager, Fischer & Kerrn ActiveSignature, Symprex EMail Signature Manager, PolicyPatrol Outlook Signatures, ...) for a centralized Outlook signature management and finally found CI-Sign. It covers all of our requirements. It's a great product, very simple to install & configure, but extremely flexible and powerful. The only downside is the documentation, but it's solved for a brilliant support service. Incredibly fast answering questions, solving doubts and even modifying the product to adapt to customer requirements. Please let me know what you think about our solutions and services. Positive feedback motivates us and constructive criticism gives us the opportunity to improve and do better. Your opinion is immensely valuable. I will read and respond to your comments personally. To enhance the authenticity of your customer voice, we would like to add a photo to it. If you agree, please enter the URL to your Xing / Linkedin / Facebook profile. We'll do the rest. If you do not want this, just leave this field empty. If you have any questions you can request a callback. Our support or sales team will be happy to call you and answer your questions. Please fill out the form below to request a callback. Interested in making some extra cash? Join our reseller program and deploy/refer our software to your customers. Please fill out the form and we'll get back to you shortly.